Burning Man is a concept. It is a place where one can express their creativity and adventuresome spirit in any which way they choose. It is a place where people come to heal, to connect, to bond, to share and most importantly, just to be. It is a personal path that is as unique as a fingerprint, as explorative as the explorer wants it to be where maybe out of the dust, there is clarity, out of the heat, perseverance, and out of the culminating burn, forgiveness, new starts and creative freedoms are found. One thing is for sure, nothing is as important as this moment, right now, right here and it is in this moment where it ALL begins. 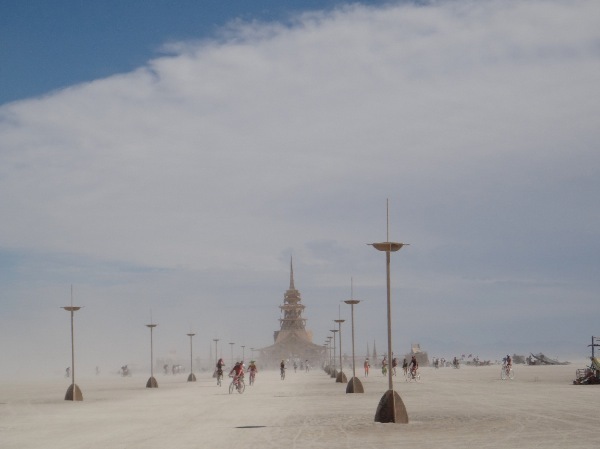 The actual Man, made out of wood, and elaborate in every sense of its architecture, is built right in the middle of a deep, gentle horseshoe shape pattern that houses the camps of over 55 thousand attendees, all of whom have paid 300 to 500 dollars to enter. A few hundred paces behind the Man, is the Temple, also built out of wood, and this year so ornate that you would swear it must have taken years to build, not just a few months. This year, I visited the Temple on Friday. As I walked through the Western entrance and the sun beat down directly above, I was humbled. I began reading some of the thousands of notes, letters, memorials and pictures to loved ones, loves gone astray, people lost, people found, profound letters of forgiveness. I paused. I watched. I walked into the middle of the Temple where two hundred people were sitting silently, in meditation. All with different beliefs as to why they were together in that small area of the Playa; all strangers, yet a tight knit community all in one. I paused and thought of my gratitude that seemed to exude from every pore; gratitude that while I may have a few struggles here and there, there are so many people in the world in such pain. Yes, I am lucky. In another section, I watched a seemingly Master Yogi practice his Yoga as though no-one was watching. His body contorted into wonderful poses and flowed so gracefully from one movement to the next. Behind the Yogi, immediately beside the inner Temple, I noticed a 30-something woman, who was kneeling toward the temple, turn to a man in a red skirt, and red lace shawl, and ask him something. I looked on from a distance as she then handed him a pair of scissors and turned away from him, swinging her long blonde braid directly in front of him. I could see her beautiful face now. Tears trickled down her cheeks. The man leaned in and whispered in her ear, his body language screaming his apprehension. He began cutting through the top of her braid. Tears streamed down his cheeks as well, as he completed the task and handed her the 8 inches of braided hair and the scissors. She placed both in her backpack and stood up and walked away, stopping briefly to tussle the back of her head and her new lighter self. I wondered how heavy that hair had been on her heart and what type of deal or sacrifice was she making in its name. I stood in the outer Temple and retold that story to a few of my friends from camp. We hypothesized on several different levels as the story evolved into our own heart felt tales of forgiveness, sacrifice and healing. We each silently wept together and in the doing, maybe, healed tiny pieces of ourselves that had been broken or missing. We departed the Temple in white-out conditions, as the wind kicked into high gear and the dust swirled around us. We were barely able to see 10 feet in front of us. We were forced to stop pedaling and dismount, forming a little circle, so that our faces were shielded from the elements. The analogy is not lost on me. It is in this circle of friends that we do find strength. It is in this circle that light and laughter extinguish, or at least, diffuse the harsh conditions of the outside world. In both my Burns, I had great delusions that I would practice my own Yoga on the Playa. Yet seemingly, the distractions and the heat are too much and I fall short. This year on two occasions I made my way to Center Camp to watch the incredible Acro Yogis. This is sort of like Cirque du Soleil meets Yoga. It is usually performed in twos or threes with one person as the base and one person as the flier. I stood there on day 1 – Tutu Tuesday, in amazement, and I said these words out loud – more or less to myself: “I so want to be a flier.” Within a nano-second, a petite girl standing next to me, said, “I can help you with that. I will be your base.” My heart raced. She was my size. How was she going to get me into the air? Oh, but she did. Her name was Anna and that is all I know of her. Her little feet pressed into my upper thighs as she told me to relax and make my legs heavy; to let myself melt into her. I tried. I searched for this profound trust of a new person and tried to let go as she told me to drop my head so that my trunk was now parallel with her legs. Her hands held my shoulders and massaged them. It was such a surreal experience. From a casual observer, Acro Yoga appeared to be so much strength, but in reality it was relaxation, at least, for the flier. It was in the letting go, that one really could soar. I could feel my awesome swell. The week pressed on and I met people from all over the world. I had ‘moments’ in time with some of them as we shared tales and experiences of our past or former selves. It was an entire week of living in the moment. No agenda. No plans. Just being. It was delightful. 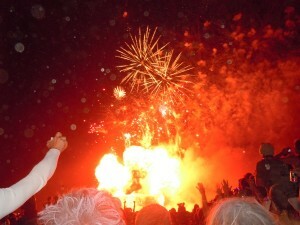 The Man was to burn on Saturday – the biggest night of the Festival. I was walking through my camp earlier in the afternoon, when I happened on to one of my campmates on his bike. He stopped and we chatted, initially talking about Yoga and progressing to a more profound conversation on the sense of self and how we grow and learn and heal. He asked me if I prayed. I said, “Well, I do talk to the Universe sometimes.” He said, “Keep doing it. Most people don’t have the capacity to reflect like we are doing right now with each other; to share, to admit our mistakes, to grow. And it is this, that we are.” It is about as deep as I had ever gone with a relative stranger. I wandered back to my camp, my head and heart slightly lighter. They were both more open, more free, more in tune with the Universe than when I had arrived. This is Burning Man. It changes people from the inside out. 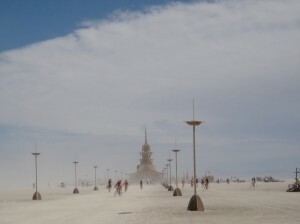 This entry was posted in Life and tagged Burning Man. Bookmark the permalink.